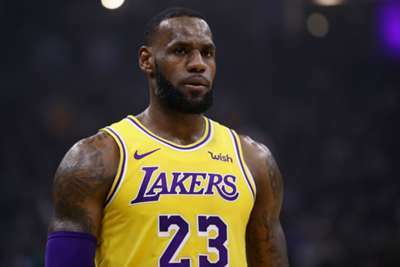 Kevin Durant blamed the media for the "toxic" environment around LeBron James as the Golden State Warriors forward explained why he does not believe the Los Angeles Lakers will land another star to accompany the four-time NBA MVP. After acquiring James in the off-season, the Lakers are reportedly planning to add a second star to pair with the three-time champion. All-Stars Jimmy Butler and Kawhi Leonard – who will become free agents in 2019 – were linked with the Lakers before being dealt to the Philadelphia 76ers and Toronto Raptors respectively. Durant will also enter free agency next year and the Warriors star has been tipped to join James in LA, however, 2014 MVP discussed the challenges of playing alongside James. "So much hype comes from being around LeBron from other people," Durant told the Bleacher Report in an interview published Wednesday. "He has so many fanboys in the media. Even the beat writers just fawn over him. I'm like, we're playing basketball here, and it's not even about basketball at certain points. "So I get why anyone wouldn't want to be in that environment because it's toxic. Especially when the attention is bulls*** attention, fluff. It's not LeBron's fault at all; it's just the fact you have so many groupies in the media that love to hang on every word. Just get out of the way and let us play basketball." Durant explained that he understands why big stars have not signed with the Lakers and addressed some of the challenges connected to playing with James.